I know mashed potatoes are almost just too easy of a recipe to even post on a blog, but for the sake of my children who will look this up when they go to college, I am going to go ahead and write down the instructions for making mashed potatoes. Just in case they don’t pick it up along the way. Are you cooking these taters or givin’ ’em swimming lessons? For big family dinners, I peel all the potatoes, but when I’m making for just our family, I usually don’t. Also if I use red potatoes instead of Russets then I leave the peels on because they are so thin. We have a long tradition of teasing each other in our family about who can eat the most mashed potatoes. For some reason, my grandfather used to always give my sister, Anna, the hardest time about being the one who ate all the mashed potatoes. He would joke that he always made an extra batch if Anna was coming. In addition to their great love of mashed potatoes, Anna, my grandfather and my father all share the habit of splattering mashed potatoes all over the kitchen while mixing them up with a hand mixer. Their messes are legendary. Now it is Cole who can put the potatoes away. This summer while we were camping we made mashed potatoes on our last night in Colorado. There were some potatoes left and I was about to throw them out when Cole told me to put them in the van because he would eat them the next day on the ride home. Cold. Cold and old is not my favorite way to eat mashed potatoes, but I have a serious appreciation for those who do their part at our house to not waste food. At 15, Cole is not doing a lot to warm my heart so I have to take my warm fuzzies where I can get them. I know I can make him smile with mashed potatoes. Even if you don’t usually cook, you can make your family smile with homemade mashed potatoes tonight. Throw in a salad and a Rotisserie chicken and call it dinner. Peel potatoes. I have three peelers because this is always more fun with friends. Quarter potatoes and put them in a large pot. Drain potatoes. Throw sticks of butter on hot potatoes. While mashing with a masher (or mixing with a hand mixer), add buttermilk a half cup at a time until you reach desired consistency. Add salt and pepper to taste. Dish into a pretty bowl and serve hot. 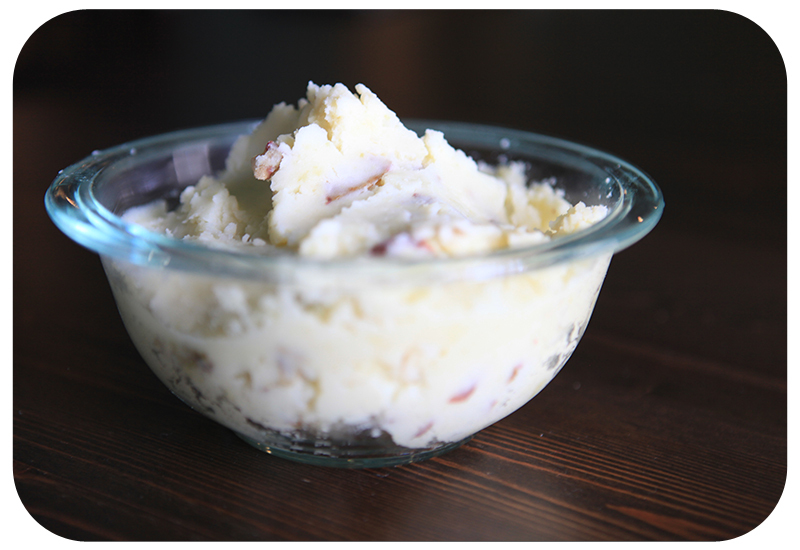 Garlic Mashed Potatoes: Roast 15-20 cloves of garlic in a dish with butter in the oven on 400 degrees for 10 minutes. Then mash these in with your potatoes. Cheddar Cheese Mashed Potato Bake: Substitute 8 ounces cream cheese for 1 cup of buttermilk when you mash the potatoes. Spread them in a large baking dish and top with shredded cheddar cheese. Then bake in the oven for 10 minutes to melt cheese. This variation can be made the day before and then refrigerated and baked on the day of serving. Just adjust the baking time to 30 minutes. Mmmm my SOUL food. That and stuffing. I used to order mashed potatoes for dessert at restaurants because I love it so much.